I recently traveled to sunny Los Angeles, California for the AWRA 2015 Specialty Conference: "Water for Urban Areas: Managing Risks and Building Resiliency." All of the presentations I listened to were very interesting, some of which used GoldSim as the tool to facilitate the studies and results presented. The highlight of the trip, of course, was to visit with some of our customers and make new friends. I also learned more about some of the unique challenges California is facing due to continued population growth, climate change, water quality conditions, and aging infrastructures. Since the focus of the conference was on managing risks and making systems more resilient, this conference was a nice fit for GoldSim. It was refreshing to see hydrologists, civil engineers, and water utility managers discussing the use of uncertainty and risk as vital to their planning processes. Below is a summary of my conference highlights. The University of Utah is doing some really innovative work contributing to advances in integrated system modeling and downscaling climate change impacts. The university is finding ways to incorporate GoldSim's dynamic and visual framework to into their ci-water tools to model integrated water management scenarios under climate uncertainty. In one of their studies, Erfan Goharian used GoldSim to combine the integrated water resources management (IWRM) process with the uncertainty of key factors for the case study of Salt Lake City, Utah. The first part of the project involved building the integrated model of hydrologic, water supply, urban stormwater, groundwater, and water demand. 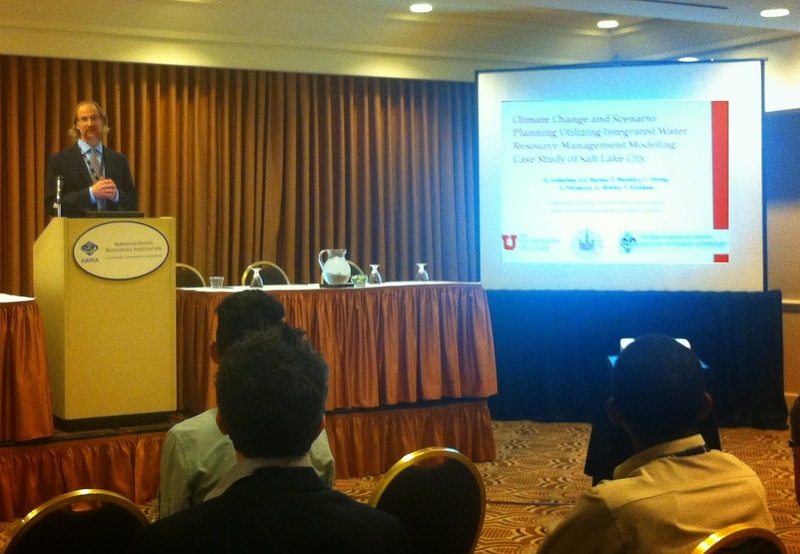 The next step was to incorporate the IWRM model with the uncertainty of climate, urban growth, and policy drivers. The result is a framework that efficiently calculates supply reliability for the system as a whole. San Francisco Public Utilities Commission collaborated with GoldSim to develop a dam operations reliability model to quantify the risk associated with reservoir operations during construction of a new dam. This model simulates potential (though unlikely) failure events within the operations procedures, dam outlet valves and other equipment, and the unforeseen flood flows. The GoldSim model uses the Reliability Module to simulate these potential failures. Alexis Dufour, a water resources engineer in the Hydrology and Water System Modeling group of San Francisco PUC was instrumental in pulling together the information and modeling concepts necessary to build an informative model. Since the time we began work on this study, California has not experienced any flooding. Quite to the contrary, as Governor Jerry Brown recently imposed mandatory water restrictions on all residents, businesses and farms in the state to reduce water demands by 25%. The study confirmed that there is a 25% chance of flooding the construction site but at least the drought offers some sense of security that flooding will likely not occur any time soon! The factors and events that might cause the water level to rise beyond the safe zone were considered. 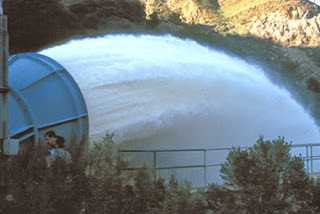 These factors include the uncertainty of the climate, reliability and availability of system components, the communication and response time of the dam operations team, and the uncertainty of the downstream conditions. The system components include power supply, valve actuators, debris removal facilities, and the SCADA system, and a treatment plant . The model allows the creation of multiple failure modes for components, each of which are either defined by stochastic distributions or specified conditions. Failures that occur according to a distribution are a function of external and internal factors such as water quality and valve open/close cycles. Interdependencies are also included in the study, where the failure of one process or component causes another component to wear more quickly or fail. Flood operations must follow certain prescribed steps, which may not be followed as expected. This operational uncertainty and reliability of human interaction is also included. The model predicts reliability metrics for the overall system, and for individual components within that system. Jessica Fox with Central Arizona Project (CAP) presented on the Central Arizona Project Service Area Model (CAP:SAM) model, which was used to model growth and uncertainty for the Central Arizona Groundwater Replenishment District. CAP:SAM was developed using GoldSim to simulate 80 separate water utilities that serve 5.3 million people, spread over 23,800 square miles. The model fulfills each utility's projected demand based on their unique portfolio of up to 15 different supply types, and the model allows dynamic adjustment of spatially‐explicit housing unit projections. This model makes particularly extensive use of GoldSim's array functions in which calculation steps are applied to entire classes of users and water supply types. This approach also results in rapid model execution, which has made it possible for model development and testing to proceed in parallel. CAP:SAM also supports risk and reliability analysis utilizing GoldSim's extensive stochastic functionality, and it is ideally situated for systematic approaches such as Robust Decision Making. Before the conference started, I was able to make it down to Manhattan Beach, which is only 20 minutes drive from the venue. The weather was perfect! One nice thing about L.A. is that you can always find nice places to eat. I was able to join up with University of Utah research staff and students at a Persian restaurant one of the evenings. I really enjoyed the Kashk Badenjan and Dough drink. Overall, this conference was very enjoyable and informative. I highly recommend attending AWRA conferences if you are interested in learning more about current issues in water resources.